In my time at Dartmouth I have been responsible for three homepage designs. For the most recent version, launched in August of 2006, I collaborated with colleagues in the Office of Public Affairs. We formed a working group called The HomeTeam, established oversight with senior leadership of the College, and embarked on six months of user research, followed by two months of informed design. We decided early on that we did not want to “tell and sell” Dartmouth. Effectively representing Dartmouth online could not be achieved through static, official narrative. Instead we sought ways to “show” the Dartmouth Experience. 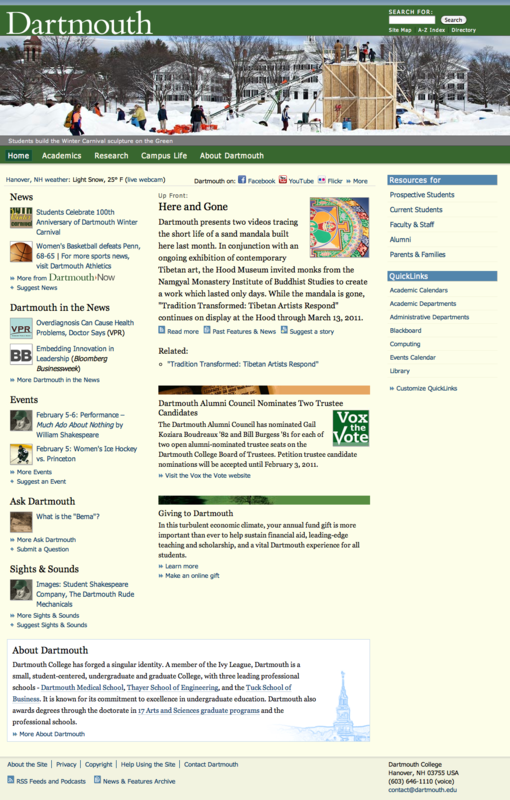 We opted to use the site as a news source, highlighting the “now” of Dartmouth through stories, events, and features. While the Dartmouth homepage requires daily care and feeding, it serves an important role in representing the vibrancy of the College, both internally and to the world at large. Another thing we recognized early on was that the success of the site depended on engaging the Dartmouth community in the design process. People at Dartmouth use the homepage as their portal to information, activities, and tools that are part of their work. If the homepage did not serve their needs, we would be introducing a frustration into their daily lives. 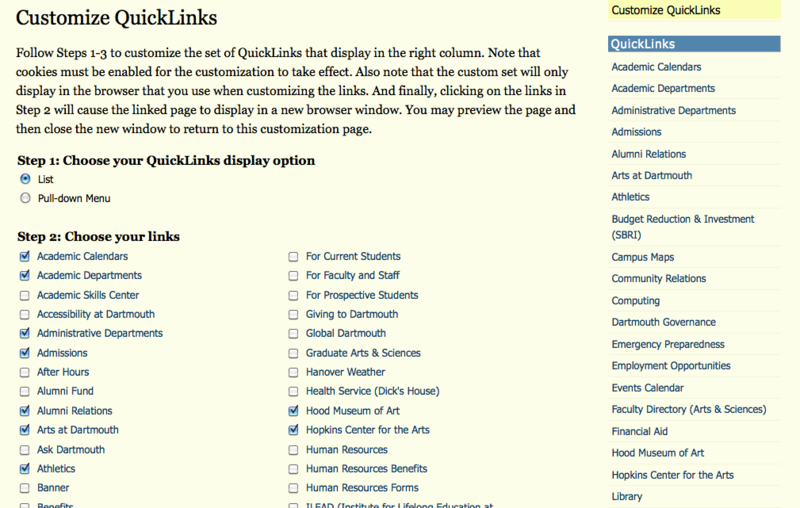 The Dartmouth homepage allows users to create a custom set of QuickLinks on the home page, providing easy access to commonly used website and applications. We spent a good deal of time talking to the community about their needs, checking in through Web Town Meetings to share design ideas and gather feedback, and posting our work and progress and requesting feedback through the HomeTeam website. For the design, we used a flexible, three-column layout with a full-width photo at the top of the page, similar to a newspaper layout. The widescreen aspect of the photos can be challenging, but the College photographer has a wonderful eye for wide shots. As of this writing, the design we launched in 2006 is still Dartmouth’s homepage. Five years is an eternity on the web, with its shifting design trends. While I expect a redesign within the next year or so, the current design still serves Dartmouth well, thanks in large part to the good work of its editors who keep the content and images fresh and interesting.